It's not all barbecue and chili in Texas, you know. We Texans are an eclectic bunch who will two-step a night away at Billy Bob's and sit down to elegant French cuisine the next. 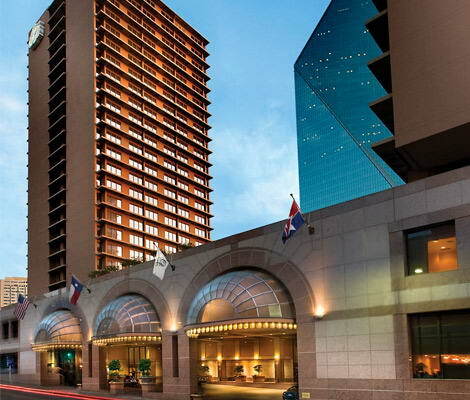 In search of the latter, I arrived at the Fairmont Hotel's Pyramid Room in downtown Dallas on a rainy afternoon recently. Master Chef John Edwards and I chatted in the Pyramid Room's cozy lounge and, among other things, we talked about what it's like to be a Master Chef, as well as the Fairmont's European Master Chef Series, a preview of which I would receive that evening. Chef Edwards, born and bred in Dallas, emphasizes that anyone wishing to enter the field of culinary arts must expect it to occupy a significant portion of his or her life. "You've got to pay your dues," he says. "I peeled a lot of carrots and potatoes when I first entered the field." Regardless of educational credentials, Chef Edwards believes that a starting-from-scratch background is essential to understanding the business, as well as the art of preparing and serving fine food. "It's a wonderful profession, and I recommend it, but you must truly love the field," he adds. "I haven't had a Christmas off in 16 years, but that's the whole point. You would rather be cooking for others." Chef Edwards admits to being a hands-on chef, although he supervises a staff of as many as eight. He is in charge of events planning and coordinating, menu planning and purchasing, as well. "The Pyramid is kind of like the old lady of Dallas because it's been here for 27 years. It's one of the original gourmet rooms for Dallas that is still around, and we have a lot of steady clientele who are regulars and have been coming here all along. They like a lot of the old standbys like Lobster Thermidor and barnaise. We don't have those things on the menu, but we always prepare them, so on a given Friday or Saturday night we'll be preparing many of those dishes. For the regulars we will cook just about anything, so it's almost like having their own club in a way. But then for the younger set or the newer customers who want to be more adventurous, I'll do the Thai crab cakes, the Shrimp Tempura, or we'll prepare a sushi appetizer. We'll play with a lot of different international cuisine, but of late we have gone back to the idea of being a French restaurant, which I enjoy because I get to share these recipes with European chefs Gerard Vie and Manuel Martinez. We are going back to being strictly French with complex but mild flavors -- refined cuisine that is very elegant, very rich -- just because that's the way the Pyramid started, and that's the way we see ourselves. We have come full circle. In the early eighties, we were a bit out of style when all the new hotels were being built. But then we redid our lobby, we completely rebuilt this room, and have weathered the storm and are back where we want to be. I think everything old is new again." Chef Edwards is enthusiastic about the return to traditional French cuisine. He asserts that, despite its claim to French cuisine and an unwavering commitment to quality without sacrifice, the Pyramid Room is not a stuffy, pretentious place, but a warm and beautiful setting for an exceptional dining experience. Because of its elegance, the Pyramid Room has seen many birthdays, anniversaries and marriage proposals. Chef Edwards and his staff have written tender proposals in chocolate sauce and presented delectable desserts garnished with engagement rings. And while the Pyramid Room is happy to contribute to and participate in the celebrations of its guests, Chef Edwards carefully points out that it is a dining room where the preparation, presentation and enjoyment of food is celebrated even more. "Our $36.00 table d'hte is the best deal in town, in my opinion. But we do have the problem of being considered a special-event restaurant. A lot of people will say, 'I don't want to get dressed up.' But it's not stuffy like people might think. It's a very relaxing restaurant. In fact, even when we are packed the acoustics of the room are so wonderful you can whisper and still be heard. We have soothing music. The design, the furniture and decor -- it's all very relaxing and tranquil." "It can be a tough sell being downtown, but the proximity of the Arts District is wonderful, and now we have the West End. We are right in the middle of what's going on -- the Trolley Car, the Meyerson, plus so many people are moving closer to downtown. There's a lot of serious development going on." When asked what he cooks for himself, Chef Edwards confesses to seldom sitting down to a bowl of Rice Krispies. Instead, he utilizes his talents in preparing the out-of-the-ordinary dishes that he loves such as tripe, sushi and tongue. Chef Edwards confirmed my suspicious regarding meringue. In the hope that a Master Chef would possess secrets unknown to most of us, I asked him if meringue could be made in such a way that the little sugar beads wouldn't form on the surface. "It is the nature of meringue to weep," he told me, however. "What we are doing right now is a baked meringue, a Floating Island, and it's just a simple meringue. You beat your egg whites first and let them form stiff peaks before adding sugar. And then beat just a little bit, maybe 15 seconds more, then we put them into souffl dishes and bake them in the oven until they rise up about half an inch out of the souffl dish. Then we unmold and serve them floating in Sauce Anglaise with caramel dripped on top. And since we coat it in caramel, the beads don't matter. When we do our baked meringue disks, we use equal parts sugar and egg whites, and we fold in ground hazelnuts, and then pipe those and cook them in a 200 degree oven for about 3 hours. They dry out and make nice meringue disks, and we make cake out of them, but if you put that cake in the refrigerator, it will start to sweat immediately." Of course," he says, "our big trick is to use a blow torch to brown meringue," but he recommends using a light hand. "We glaze our créme brùle with a blowtorch. You do that to get that nice caramelized sugar topping." Another Chef Edwards tip: "A good way to make a caramel sauce is to take a dry pan, really hot, put sugar in and stir with a wooden spoon until it caramelizes, then add an equal amount of cream -- stand back because it bubbles like crazy. It makes a perfect caramel. You can put that on or underneath a flan. It's a lot easier to work with." "We are definitely on a French tilt now, which I enjoy. I like to have that moniker on this restaurant because of the influx of these great chefs, like Manuel Martinez. I want to pick his brain and see what he is doing. They are on such solid ground in France -- hundreds of years of great cuisine. And the quality of the product is just phenomenal. We are on our way in this country but there, the quality is across the board. Good food is ingrained in the culture from the bottom to the top -- the best preparation and the best ingredients. Even in France they are using the Thai and oriental ingredients And here of course is the Latino influence with the plantain and the salsas. That's very exciting, and we'll play with some of those ingredients, but we still want to keep traditional in our way of preparation." We talked for an hour, and I could have gone on and on, but Chef Edwards returned to the kitchen in order to join Chef Adrienne Biasin in the preparation of that evening's bill of fare. The menu of Chef Adrienne Biasin, third in the series, will debut at the Pyramid Room Monday, September 8, through Saturday, September 13. The European Master Chef Series, brainchild of Fairmont General Manager Cyril Isnard, himself French born, will present a total of four Michelin-rated European chefs to Dallas in 1997. The menu of Chef Adrienne Biasin, third in the series, will debut at the Pyramid Room Monday, September 8, through Saturday, September 13. According to Mr. Isnard, "The European Masters series allows some of the world's finest chefs the opportunity to discover Dallas and its sophisticated gourmets. Our previous European Masters guests, Chef Gerard Vie and Chef Manuel Martinez, have been very well received, and we are honored to have Chef Biasin bring her unique culinary style to the Pyramid Room." Chef Marc Meneau will be the fourth and final chef in this year's Series. Chef Biasin, whose Paris restaurant is frequented not only by her loyal patrons, but French presidents and prime ministers as well, finds inspiration for her cooking style from the French countryside, using very fresh products and meats of the highest quality. She is prominent in the French media, including hosting her own cooking show and authoring a column in Figaro Madame, and two cookbooks. She teaches at the Osaka Cooking School of Japan. Wines served with the meal were a Chablis, 1994, Laurent Tribut, and a Beaujolais, 1996, Louis Jadot, Villages. To put it very mildly, the menu was a success -- the food delicious and beautifully presented, the service impeccable. Service at the Pyramid Room, incidentally, carries graciousness to new heights. Maitre 'd Michel Boutemy and his staff efficiently attend to the needs and requests of their patrons in a completely charming and understated manner. And the room itself is responsible for much of the serene ambiance; lighting is soft, and music from the grand piano not two tables away did nothing to intrude upon the sounds of gentle conversation around me. One of the Pyramid Room's signature items is the ice swan in which the sorbet is presented: A swan made of ice, its base magically illuminated, bears between uplifted wings a small scoop of delicately flavored, refreshing sorbet. Another is the miniature petits four trees which are laden with tiny, intricate frosted cakes. It is easy to see why people think of the Pyramid on special occasions; it is a very special place. But this meal, without wine, is priced at an incredible $36.00 (with wine, it is $58.00), making the Pyramid Room a wise choice whenever excellent dining is required. Prepare to tip well, though; the level of excellent service deserves it. The Pyramid Room will validate your parking in the underground hotel parking garage, the entrance to which is on Akard Street. For reservations, call 214-720-5249. In any case, whether you are a Texan or visiting the State, I personally recommend the Pyramid Room. You will be treated like visiting royalty, fed like a king, and you will be very glad you came. Chef Edwards and Chef Biasin were good enough to share a few of their recipes. True to his word regarding new ingredients, Chef Edwards' Tempura Shrimp with Wasabi Mayonnaise contains wasabi powder. Often referred to as Japanese horseradish, wasabi is a root of the mustard family that is dried and ground to a fine powder. When reconstituted, it is used in dipping sauces for sushi and sashimi. Wasabi powder is available at Asian food stores and markets. Chef Biasin's recipes include Carrot and Tomato Cream Soup, Leg of Lamb with Ginger, and Clafoutis of Fresh Fruit, a kind of French cross between a cobbler and a quiche. In a medium-sized mixing bowl, combine the flour, cornstarch and baking powder. Whisk in the milk. Season with salt and pepper to taste. For the mayonnaise, place the egg yolks, vinegar, mustard and wasabi powder in the bowl of an electric mixer. At medium speed with whisk attachment, beat the ingredients together. When frothy, slowly (very slowly) pour in the vegetable oil. When the oil is completely emulsified, season the mayonnaise with salt and pepper. Place in a small serving dish. Heat vegetable oil in a deep pot. Oil should be 300°F. Dip shrimp into batter. Fry until golden brown. Remove shrimp and drain on paper towels. To serve, arrange four shrimp on individual plates, spiraled around the salad greens. Drizzle wasabi mayonnaise over shrimp and salad. Makes 4 servings. Peel and wash carrots and coarsely chop. Peel and seed tomatoes. Thinly slice onions. Into a stock pot add butter and onions. Saute over medium heat for 5 minutes. Add carrots, and saute for 5 more minutes. Add tomatoes, sugar, salt, pepper and nutmeg. Add boiling water and cook for 20 minutes. Remove from heat. Place soup in large blender or food processor, and puree until smooth. Add cream. Reheat for 5 to 6 minutes. Add parsley and basil. Rub lamb with garlic, salt, pepper and ginger. Heat oil and butter in a roasting pan and sear lamb on all sides. Add chopped carrot and onion to roasting pan. Saute until vegetables are golden. Add wine and thyme. Roast covered in a 375°F oven for 25 minutes. Remove lamb and keep warm. Drain stock from pan and strain through a collander. In saucepan, reduce stock until it coats the back of a spoon. Serve lamb with roasted garilic mashed potatoes. Simmer milk. Remove from heat and add butter. Set aside. Mix flour, yeast, sugar and salt. Whip eggs until fluffy, and stir into tepid milk/butter mixture. Pour over dry ingredients, and work for 1 minute with a whisk. Soak cherries in kirsch. Place cherries in a 9-inch torte pan. Pour batter over cherries, and drizzle kirsch juice over onto batter. Bake at 350°F for 30 minutes. Let cool. Serve dusted with powdered sugar.